This original 70s shirt is a bit paler than above. 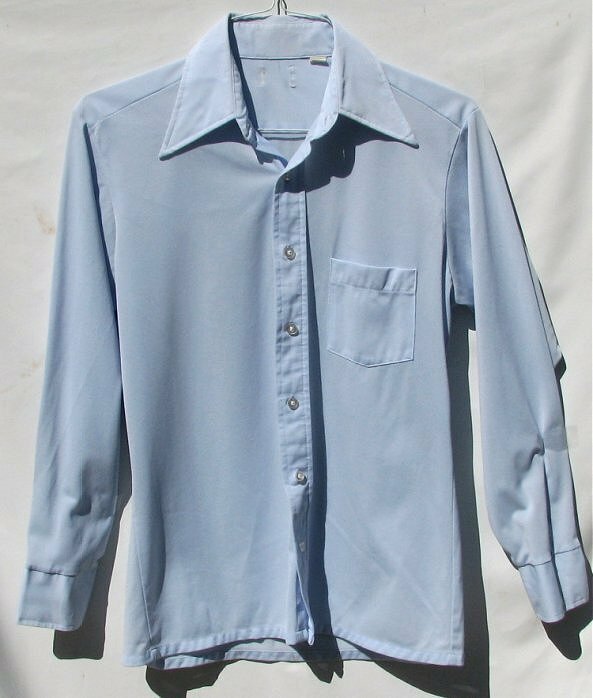 The nylon polyester blended shirt is a grayish very pale blue. The lightweight sturdy shirt has minimal if any obvious wear. It says size 15 1/2 neck and measures like a today's size Medium. The chest is 40" around and meant to fit a 36" or 36" - 38" chest. The sleeve length measured from the base of the neck is 32". The shirt has been freshly laundered and there are no obvious spots or imperfections. Machine was inside out and hang dry after wearing.